Rebecca and I set out without Christine this morning; she texted to say she would see us later due to lack of sleep. We didn't realise it, but we would not see each other again on this Camino! She's chosen to take a bus to see the Asturian mountains and then catch up with her step-sister to walk into Santiago. I'll miss her humour and wisdom. 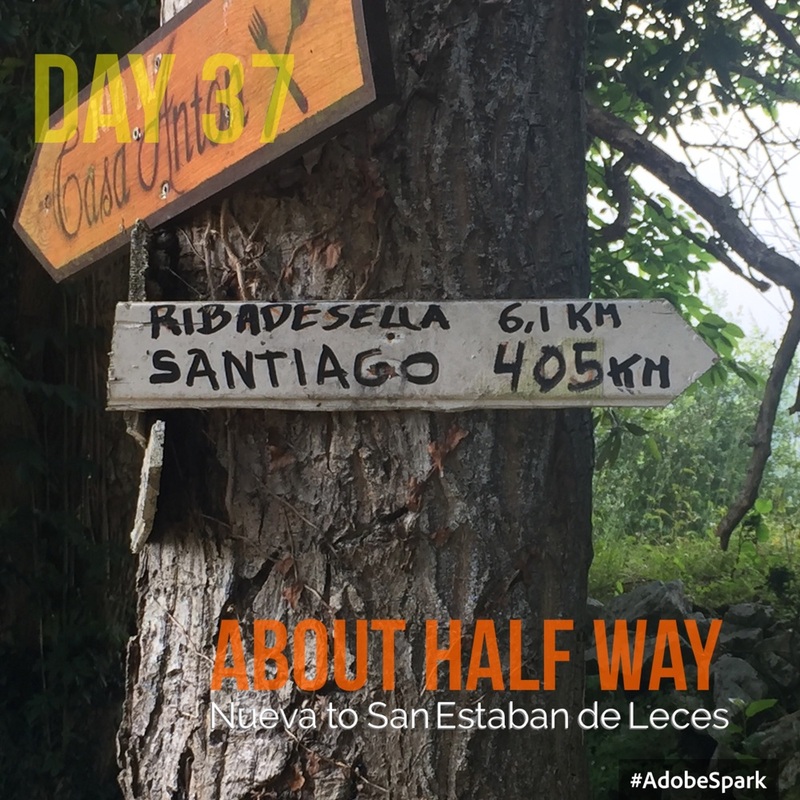 The Picos are covered with swathes of low cloud in the morning and the path takes us through woods and pastures with sudden views of the distant sea. It's very rural; small stone hamlets, lemon trees with sweet waxy flowers, slopes of bracken, stone walls, cider orchards and a medieval stone bridge. Ribadelsella is an old whaling port set on a large beach and estuary. We stop for a 3 course Menu del Dia here and pack up the left overs for supper! Then over a bridge across the estuary and along a long cliff-lined creek on the other side. This area seems to be famous for dinosaurs and life size reproductions have taken up residence on several suburban roundabouts. Then we have a hard slog up 100m elevation for an hour. When we reach San Pedro it feels like the roof of the world with the cobalt sea in the distance. It's windswept up here and the albergue at San Estaban de Leces is slightly austere, but we get a warm welcome from the Hospitalera; the dorms are clean, the showers hot and there's a nice garden with geraniums in pots . I had been obsessing about my washing and how to get it dry most of the day; but I needn't have worried. The wind and the sunny walled garden dried it in no time. Washing of clothes and bodies is a major preoccupation of pilgrims. Travelling light with only one spare set of clothes means that it cannot be put off for long! It feels like the top of the world here. Supper is the left overs from lunch and then to bed.